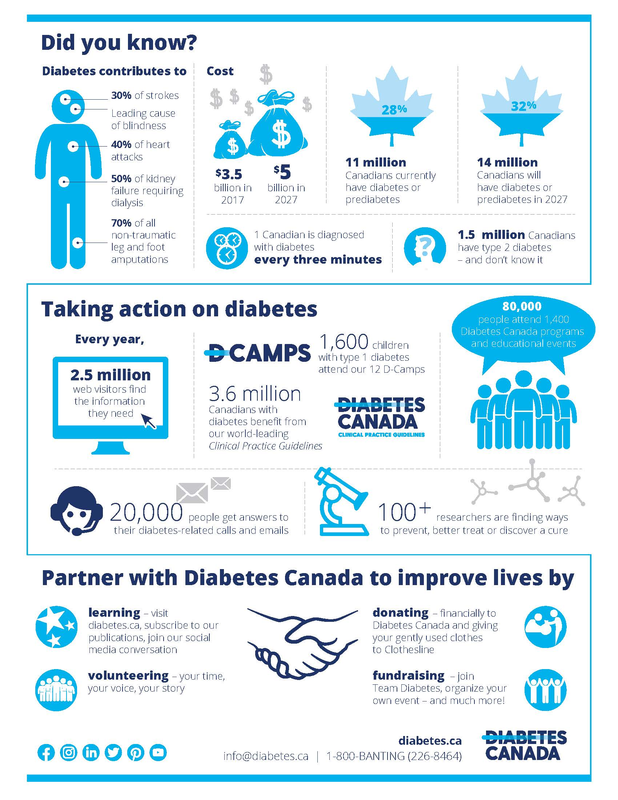 The Canadian Diabetes Association (CDA) is a registered charity that helps the 11 million Canadians living with diabetes or prediabetes. We lead the fight against diabetes by helping those affected by diabetes to live healthy lives, preventing the onset and consequences of diabetes, and discovering a cure. Type 1 diabetes is found in 5 to 10 per cent of Canadians with diabetes, and occurs when the body is unable to produce insulin, a hormone that controls the level of glucose (sugar) in the blood. The cause of type 1 diabetes is unknown and it is not preventable. Type 2 diabetes is the most common, where the pancreas either cannot effectively use or produce enough insulin. It is found in approximately 90 per cent of Canadians living with diabetes. The causes of type 2 diabetes can be genetic, behavioural and/or environmental. It usually develops in adulthood, although more children and adolescents are being diagnosed. Prediabetes occurs when an individual’s blood glucose levels are elevated, but not yet high enough to be diagnosed as type 2 diabetes. Approximately 50 per cent of those with prediabetes will go on to develop type 2 diabetes. Gestational diabetes is a temporary condition that develops during pregnancy. Blood glucose levels usually return to normal following delivery, however both mother and child are at higher risk of developing type 2 diabetes later in life. When you fundraise on behalf of the Canadian Diabetes Association (CDA), you are an extension of our representation in the community. It is helpful to familiarize yourself with diabetes and the work of the CDA so you can answer the questions you might receive. Below is some information to help you learn a little more about diabetes and the work of the CDA. If you encounter questions you can’t answer, your Team Diabetes coordinator is happy to help you find the right response. Click on the infographic to download the PDF.